Metallic CMR Ring is also called Metal Cascade Ring use in petrochemical industry is made of material like carbon steel, stainless steel or Aluminum alloy, etc. The product has features such as thin wall, heat resistant, high free volume, high capacity, low resistance, high separation efficiency and so on. It is especially suitable for rectification towers under vacuum to treat thermo sensitive, decomposable, polymerizable or cokable systems, so it is widely used in packing towers in petrochemical industry, chemical fertilizer industry and environmental protection, etc. The above data is reference to material stainless steel (AISI304) in the material thickness shown. 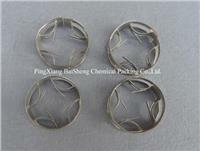 Other material available: carbon steel, stainless steel including 304, 304L, 410,316, 316L. Reduced Pressure drop occurs because the Cascade Mini Ring has its largest opening predominantly in the direction of the vapor/liquid flow which allows for easy passage, this reduces the pressure drop significantly. 3) Improved resistance to "fouling"
Improved resistance to fouling results from the directional positioning of the rings,(largest opening in direction of flow ) as any solids entering the packed bed are more easily flushed through the packing matrix. Higher operational efficiency occurs because of the preferential orientation which ensures that in most of the ring surface are positioned vertically rather than horizontally, and this is also advantageous for mass transfer. High efficiency is dependent on as much of the available surface area as possible being effectively wetted. The underside of any horizontal surface in a packed bed or tower is naturally shielded from the liquid trickling down and is therefore not fully wetted, such dry surfaces play little or no part in the mass transfer process. Cascade Mini Ring significantly reduces this effect, and therefore gives much higher plant operational efficiency.